Congress Rental USA offers the most professional-looking and sound-proof interpreter booths on the market. Designed by Audipack and Multi-Caisses, they exceed the latest ISO-4043 standards and are suitable for all types of conference systems. Congress Rental USA offers both full-size and table-top booth models for rent or sale. Photos and specifications are provided below. ... the ultimate in sound-proofing. 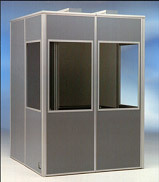 The full-size Audipack Silent Series booths meet the highest ISO standards and requirements. The wall panels are interchangeable, giving flexibility for any type of room configuration. Booths can also be extended to accommodate additional interpreters simply by adding panels. Every effort has been made in the design of the booths to provide a comfortable and professional environment for the interpreters. Ventilation systems, sufficient work space and outlets for lighting, power and cabling are some of the design features included to improve the interpreters' otherwise challenging work conditions. ... for applications where space is limited. Comes with a sturdy nylon bagï¿½	48" x 24" x 24"